Master sock knitter Ann Budd uses 2×2 rib for her start-at-the-toe socks. 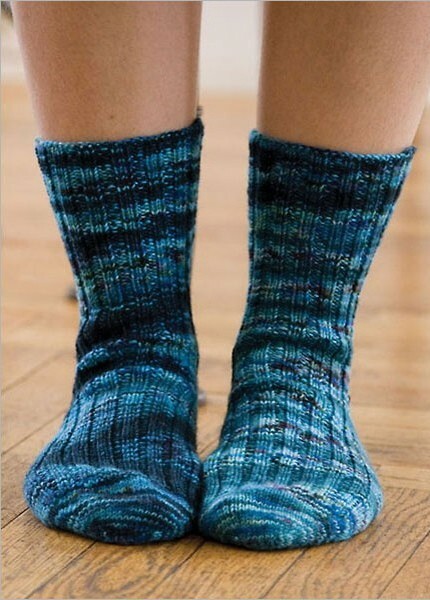 Working from the bottom up, you can knit these socks to stop just short of the ankle or run them all the way up to the knee and even over it. Make these as gifts – the stretchy rib adjusts to fit just about any leg. Ann Budd has never met a handknitted sock she didn’t like. She hasn’t worn a store-bought sock in years. Finished Size: About 6½ (7½, 8, 9, 9¾)” foot circumference and 7 (8, 9, 10, 11)” leg length from top of leg to base of heel for crew socks; 14½ (15¼, 16, 16½, 17¼)” leg length from top of leg to base of heel for knee socks. Crew socks measure 10” long; knee socks measure 16½” long. Yarn: Colinette JitterBug (100% merino; 292 yd 267 m/100 g): 1 (1, 1, 2, 2) skein(s) for crew socks; 1 (2, 2, 2, 2) skein(s) for knee socks. Socks shown in #85 jay (blue) and #71 fire (red). Yarn distributed by Unique Kolours.